When Steve Jobs unveiled the first iPhone in 2007, not many would have dreamt that it would completely revolutionize the smartphone industry and re-invent the phone. 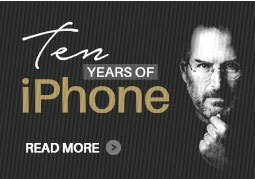 But after 10 years, iPhone sales include 60% of Apple’s revenue, making it world’s most valuable brand. Today, when iPhone is celebrating 10 years, take a look at our infographic as we have compiled iPhone’s journey over the years.